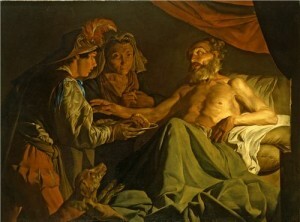 The old and blind Isaac summons his eldest son Esau to prepare his meal and receive a blessing. His wife Rebecca substitutes her favourite son Jacob who wears goat-skin gloves in order to resemble his hairy brother. He steps forward gingerly whilst Rebecca gestures to us not to reveal the deception. The dog sniffing the meat indicates that the biblical story also works as an allegory of the Five Senses – smell, taste, touch, hearing and sight. Stom was born in the Netherlands, but lived mainly in Naples and Sicily. His style was based on that of Caravaggio (1571 – 1610) with its dramatic lighting, emotional directness and realistic figures.